PHILADELPHIA (WPVI) -- One Kansas City toddler's Halloween costume has scored rave reviews and may make Philadelphia Eagles feel a bit nostalgic. 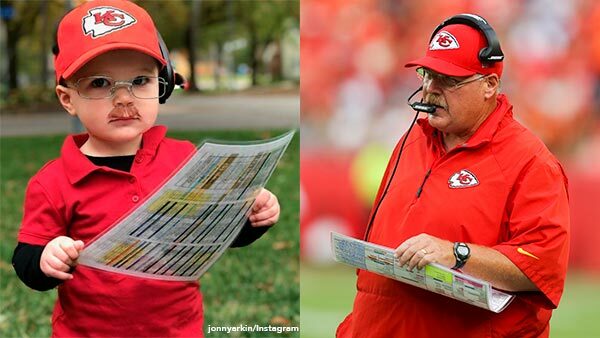 Fifteen-month-old Abe Arkin dressed up as former Eagles and current Chiefs head coach Andy Reid. Abe, whose parents lovingly refer to him as 'Bubba,' had everything down: the hat, the headset, the glasses, the moustache, the game plan, and even the look of Reid. "My wife's brother and his girlfriend actually came up with the idea after we were struggling to find a costume for our son. He is 15 months and 35 pounds so we were looking for some kind of big guy costume, and then they came up with the idea. We instantly fell in love because my wife Claire is such a big Chiefs fan," Abe's father Jonny told Action News. "Every once in a while he would throw his play card and we would laugh thinking he was saying 'Why didn't we go for it on 4th down!'" Jonny said. Jonny said since it was posted online, Kansas City has fallen in love with Abe's Halloween costume. And the parents still can't get over the uncanny resemblance their son has with the head coach. "We knew it was a fun costume, but we didn't know he was going to look that much like Andy Reid. I mean, their faces are really similar," Jonny said. So, Abe, take this moment to enjoy your newfound fame. The time is yours.